Ayesha Ahmad, Lu Gram, Sarah Hawkes Maxine Molyneux, Ann Varley, Kalpana Wilson, Punam Yadav. Chaired by Jennie Gamlin. 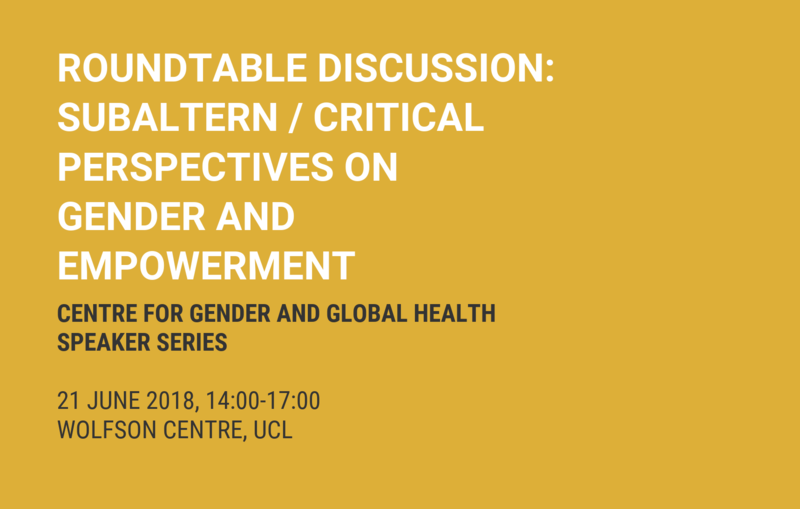 On the 21st June 2018, the Centre for Gender and Global Health and UCL Anthropology will be holding a roundtable discussion on Subaltern and Critical Perspectives on Gender and Empowerment, open to colleagues from across UCL, Bloomsbury Universities and Colleges working on Gender and Health /Development to join us for an opportunity to share critical ideas about gender and empowerment within our own research, followed a drink and an opportunity for informal discussion about potential future collaborations. A short thematic outline will be shared shortly. The session will be led by Ayesha Ahmad, Lu Gram, Sarah Hawkes, Maxine Molyneux, Ann Varley, Kalpana Wilson, Punam Yadav and Jennie Gamlin. Please register here to confirm your participation.